James R. Locher III has more than 25 years of professional experience in both the executive and legislative branches of the federal government, and is executive director of the Project on National Security Reform. 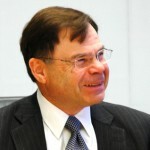 Locher graduated from the United States Military Academy in 1968, received an MBA from the Harvard Graduate School of Business Administration in 1974, and was awarded an honorary Doctor of Laws degree from Hampden-Sydney College in 1992. In 1978, Locher joined the Senate Committee on Armed Services as a professional staff member. Initially, he served as the senior adviser on international security affairs and force projection programs. In 1985, the committee assigned Locher responsibility for strategy and organization. He directed the bipartisan staff effort that resulted in the Goldwater-Nichols Defense Reorganization Act of 1986 and served as the senior staffer for the special operations and low-intensity conflict reform legislation, known as the Cohen-Nunn Amendment.